What does Agrumi have in common with artists Eduardo Paollozzi, Peter Blake, Howard Hodgkin, Bridget Riley and Michael Craig-Martin? Answer: they have all had work commissioned by the Ivy. Time was when the Ivy was a lone, but legendary restaurant in the heart of London’s theatre land. It played host to regulars Laurence Olivier, Vivien Leigh, Marlene Dietrich and Noël Coward. Time has moved on though and the original restaurant has been joined by sister restaurants around London. 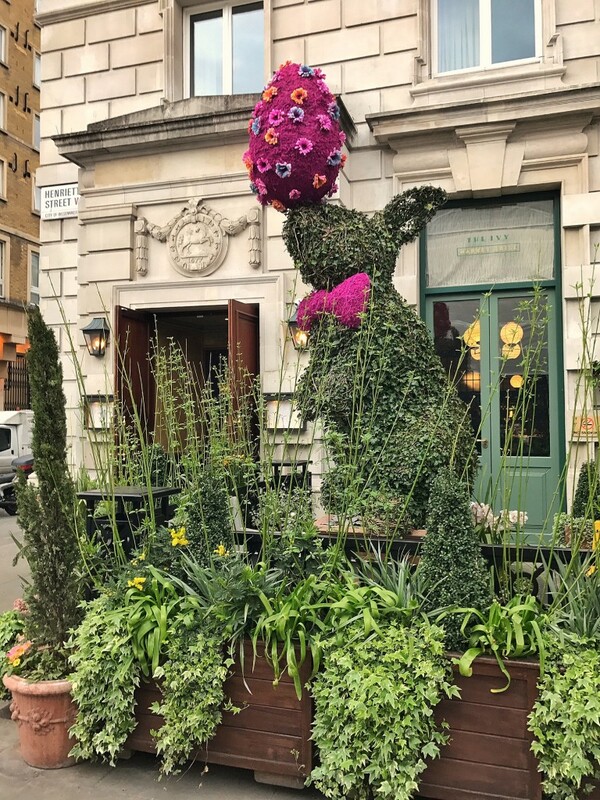 This Easter Agrumi was honoured to join the pantheon of illustrious British artists associated with the Ivy by providing the Chelsea branch with a bunny appropriately made out of small-leafed living Hedera (or Ivy) and planted in a specially-commissioned terracotta pot from the Whichford Pottery. The figure stands over two meters tall and, as you can see, it is balancing meter high pink egg on its nose. The egg is made of dyed natural moss and the bunny’s whiskers are made from natural brush bristles. For a finishing touch we put a pink bow tie on the figure to match those worn by the Ivy’s waiters. Our efforts for Easter and the Ivy chain didn’t stop there. 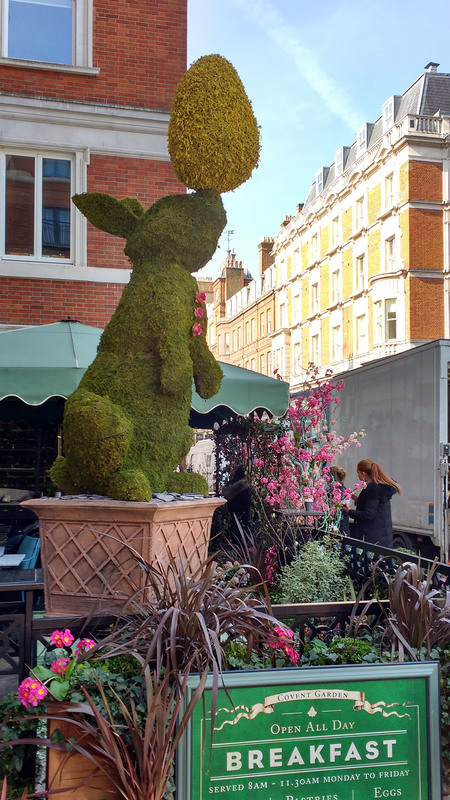 We also made an identical bunny for the Covent Garden branch – except this one is fabricated from green dyed natural moss and, instead of a bow tie, it has silk daisy flowers as buttons down its front. A fetching combination as our photograph shows! Finally, we made a couple of meter high bunnies for the Marylebone branch each standing in more specially commissioned Whichford pots. Give us a call to see how we can help you connect with your customers in original ways. With lots of events coming up over the summer season now’s the time to think about using Agrumi’s topiary to make your business stand out.